I have wanted to design my own cutters for… well… pretty much forever. I have a hard time finding cutters that match the ideas in my head, so I’ve always wanted to make my own. I’ve kind of dragged my feet about doing it for one reason or another. Mike has encouraged me to do it for a long time, and a good cookie friend encouraged me recently, so guess what? I finally did it! 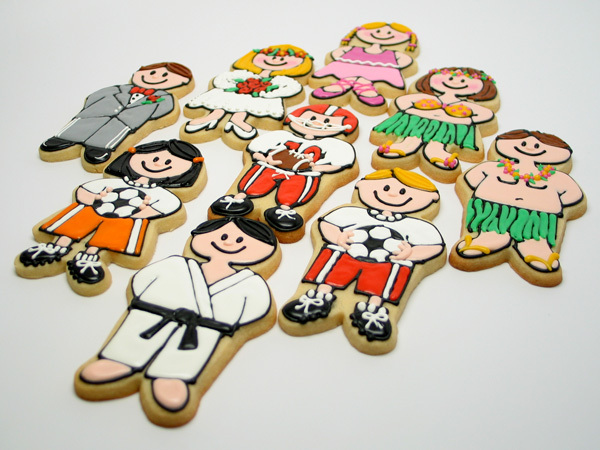 It’s so exciting to see it go from an idea in my head to a cookie cutter and then on to the actual cookies that I had visualized for it. A baby! I wanted him/her to be easy to decorate, simple, but customizable. Here’s how I decorated it. I wanted to be able to do some easy cute toes and NO HANDS. I’m not a fan of drawing hands. This is a super simple design. You can add some clothes. There, that’s better. Jammies and a binky and all is well in the world. The second design is one that I’ve wanted for a long time. 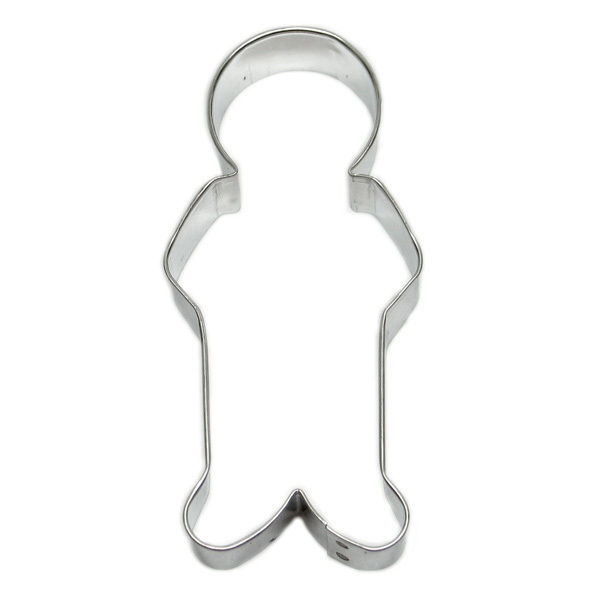 Wilton used to have a pretty decent one, but it was discontinued a while back, and it just seemed like there was a need for a plain old girl. 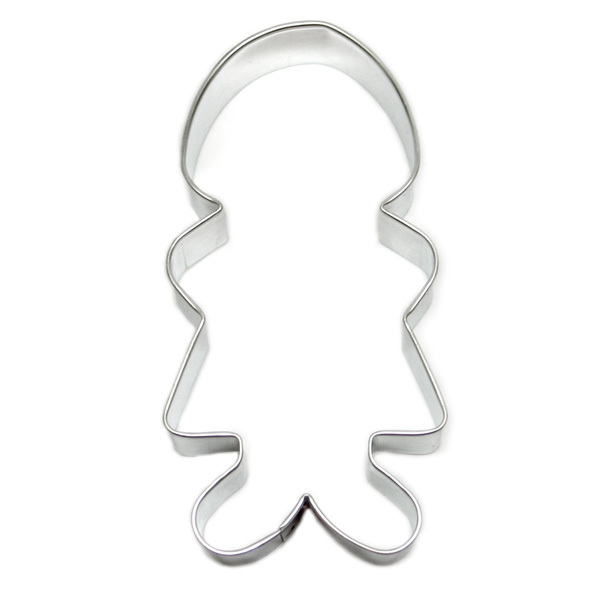 Not a gingerbread girl, but a GIRL that you could decorate all different ways. So my second cutter is…. A girl! And along the same lines, my third cutter is…. 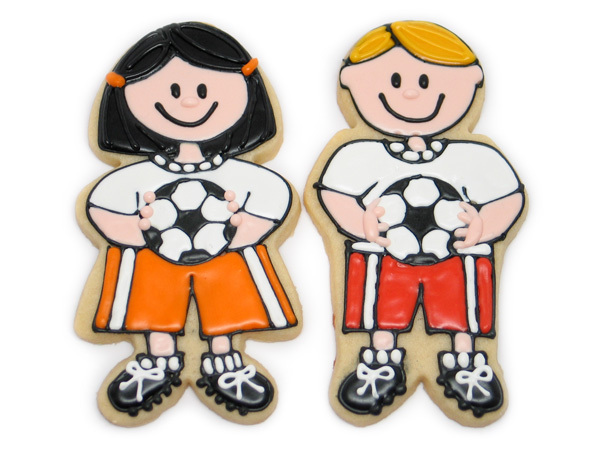 These guys are obviously soccer kids, but you could do any sport. Basketball would be very similar. Mike helped me figure out how to do hands without having to do hands. You make them hold something and just put some round circles for fingers. Easy! 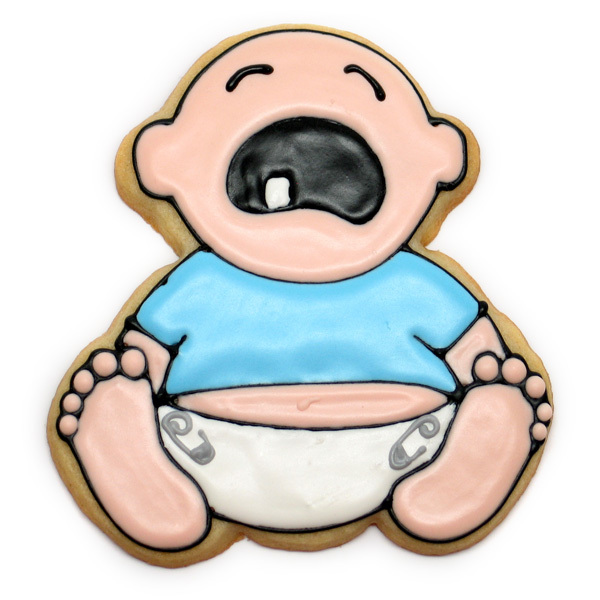 So it’s not a Rembrandt, but it’ll do for a cookie. 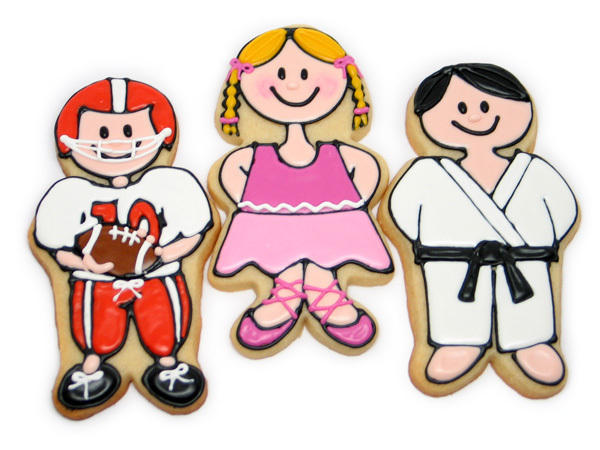 Football, ballet, Karate. Notice how you can just tuck their hands behind them if you don’t want them to hold anything? Luau! 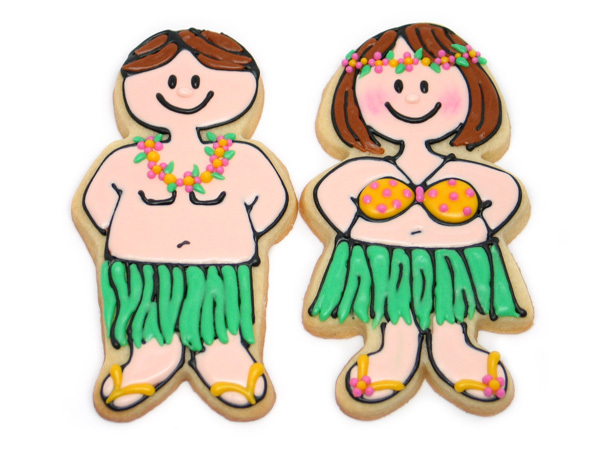 I would just like to point out that that hula girl is a self portrait. ha ha! And finally (for now!) 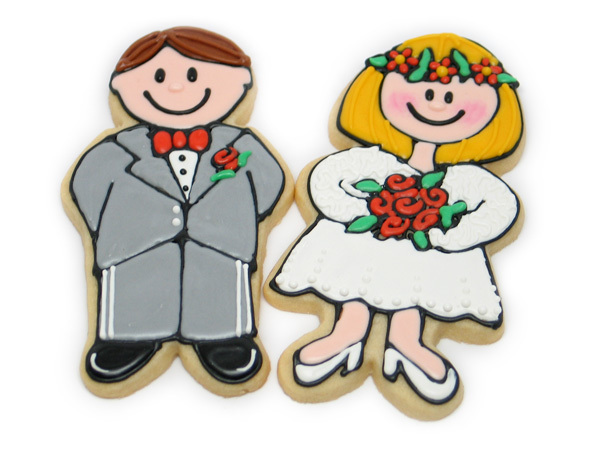 a bride and groom. I’m going to work on more designs and do some decorating tutorials for these guys, but this will have to do for now. Oh, and sorry about the lack of cultural diversity in these kids. I was decorating late and was lazy so I used all the same color. Next time I’ll be more culturally diverse. So do you want some of my new cutters? I’m going to give away a set of all three to 10 lucky blog commenters. Just post a comment (maybe you could tell me what you would like me to do for my next batch of cutters! ), and I’ll choose 10 at random using random.org and send you the cutters. Contest ends at midnight Friday, April 6, and I will announce the winners on April 7 (because that’s my Mom’s birthday). 🙂 OH– and if you are going to Spring Fling, you will be receiving a set there. You can still comment on the blog post, but please make a note that you will be at Spring Fling so that I can choose another winner. Good luck! And thanks for putting up with my long absence! 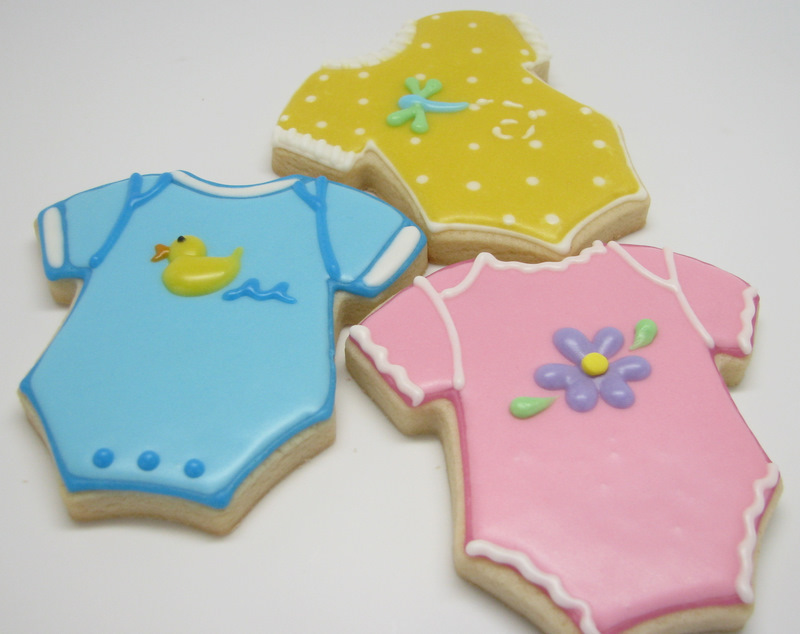 To make these cute cookies, start by baking a batch of onesie cookies using one of our recipes or your own. 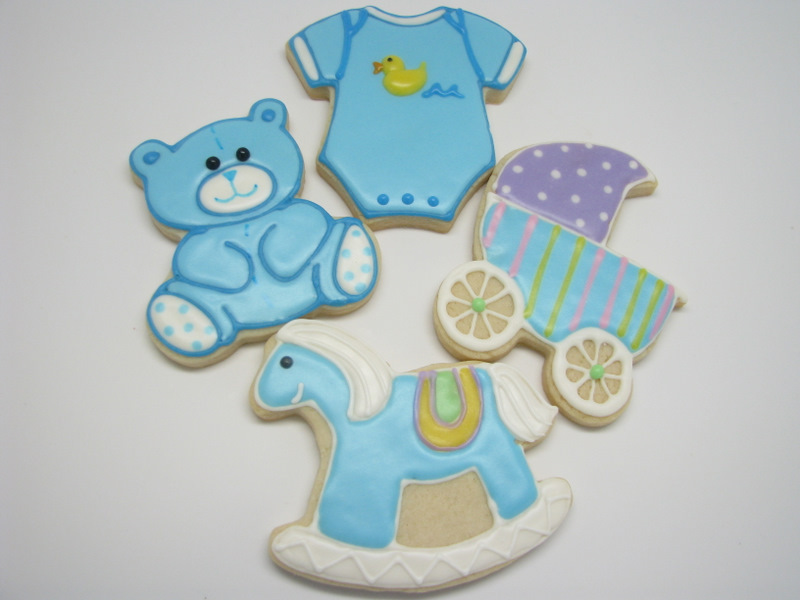 For every 2 dozen cookies, make a batch of Meringue Powder Buttercream or Royal Icing. Mix colors according to your preferences, baby gender, etc. Since color combinations are endless, just remember a couple of rules. First, the outlines and piped designs take little frosting, so make smaller amounts of those colors, and larger amounts of the colors that will be used for glaze. Second, for all pastel colors, start with a tiny bit of coloring and add to it until you get the color you want. Add a few drops of Bright White to each color to soften it. For brighter colors, omit the white. Select the tip sizes you will need for your design and insert them into disposable bags. The tips you need will depend on your desired piped design size. See the chart to below for help. For outlining, I prefer tip #2. Fill the bags with your colored frosting, and close them with rubber bands. This chart shows approximate teardrop sizes using tips #1 – #4. It’s pretty hard to get true-to-life sizes on a computer screen, but it might at least give you an idea of their size in relation to each other. Your actual size will be a bit smaller than this illustration. 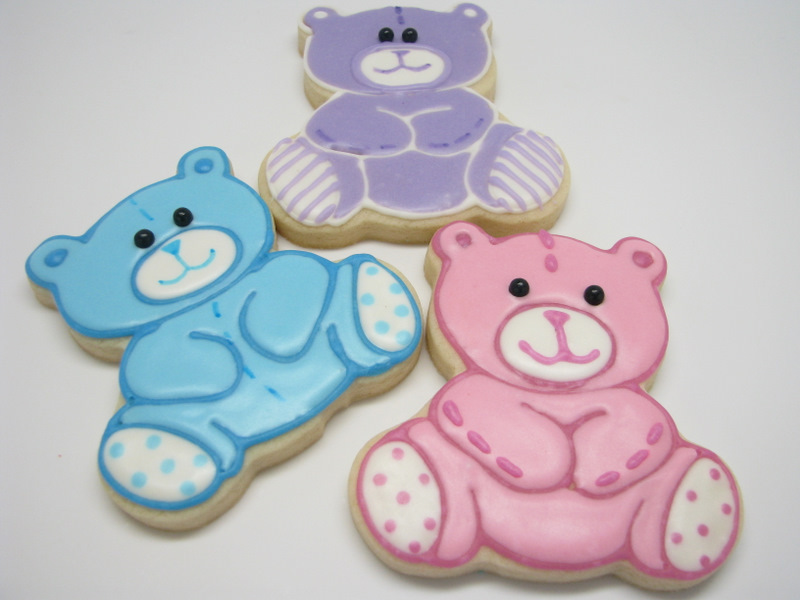 To make glaze, add water to frosting, a few drops at a time, until it is a thin consistency. A drop of glaze should disappear into the mass by 3 or 4 seconds. 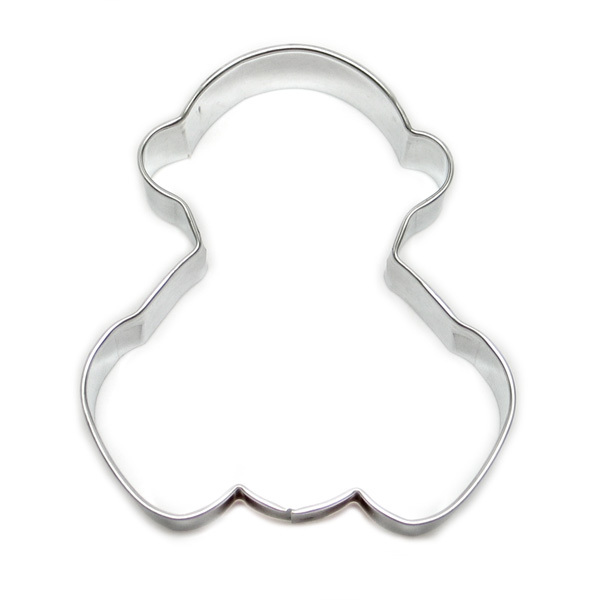 Scoop glaze onto cookie with a spatula. Spread toward edges, adding more as needed, and scraping off any excess. Allow to dry for several hours. Outline entire cookie with a #2 tip. Then use the illustration above as a guide for piping the seams for the sleeve and shoulder area. Experiment with the necklines and sleeves to create different looks. Some options include broken lines for stitching, wavy lines for lace, and “train tracks” for ribbing. Add different features (such as snaps and/or stitching) to finish the bottom. All of the piped designs that follow are made with a series of teardrop shapes. If you can master the teardrop, you can do any of these designs (and many others!) To make a teardrop, start with your bag at a 45 degree angle, with the tip slightly off the surface. Start squeezing until the round side of the teardrop is the desired size. Gradually release pressure as you pull back toward the tip of the drop. Stop squeezing, pull your bag away, and you’re done! Hearts are two slanted teardrops with tails meeting. First make a right-pointing teardrop, then a left-pointing teardrop next to it. Butterflies are made by piping two hearts, connected as shown. Finish by piping a thick line down the middle with another color. Dragonflies are made just like butterflies, except the teardrop shapes are elongated as shown. To create the effect of flying, try piping a dotted path behind the bug. The base of the duck is made with 3 yellow teardrops. Curve the ends of the body and wing upward as shown. Using a smaller tip, pipe a beak with 2 tiny teardrops, and an eye with a small dot. Create cute rose buds by starting with a single teardrop. Follow with a piped swirl on top using tip #1. Finally add leaves by piping two smaller green teardrops. To create simple flowers, pipe inward-facing teardrops for petals. Then add a large dot in the center, overlapping the tails. You can also add a green teardrop or two for leaves. So there you go! Master these simple tear drops and all sorts of designs are open to you! 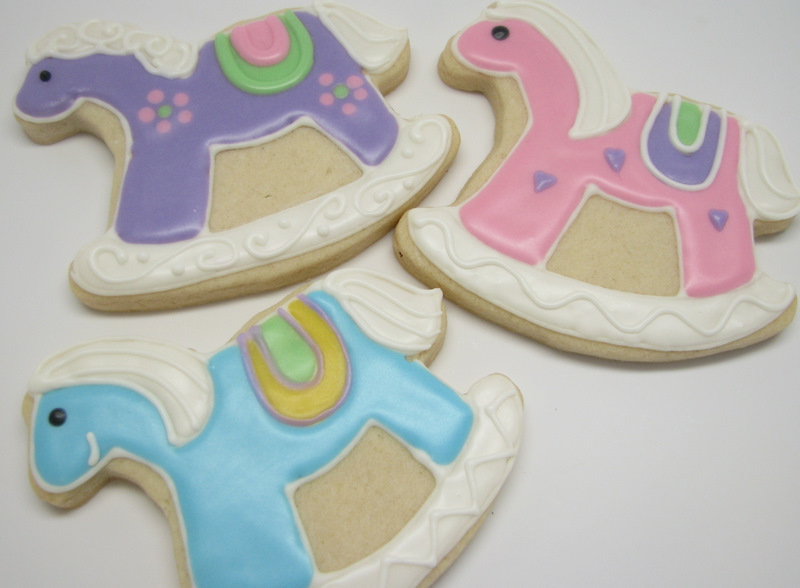 Use the examples of onesie cookies on this page as inspiration or come up with your own designs. 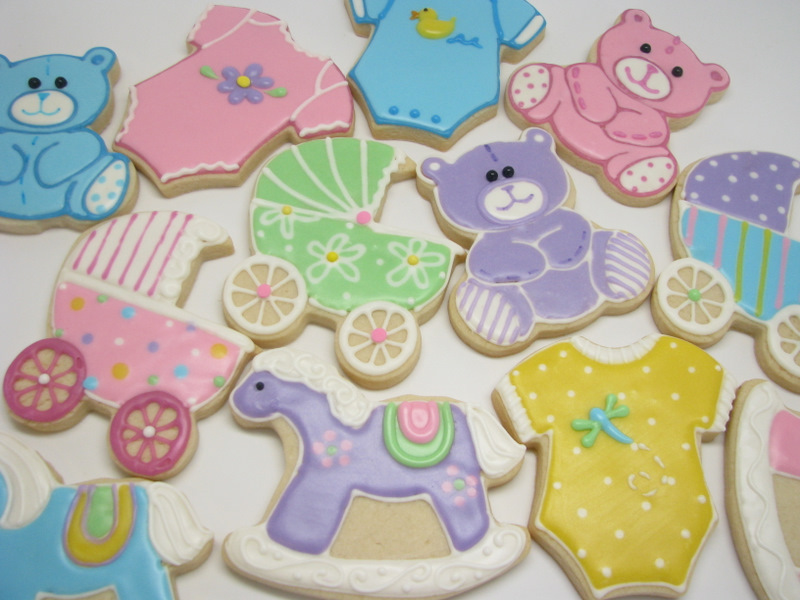 Would you like to make some onesie cookies? 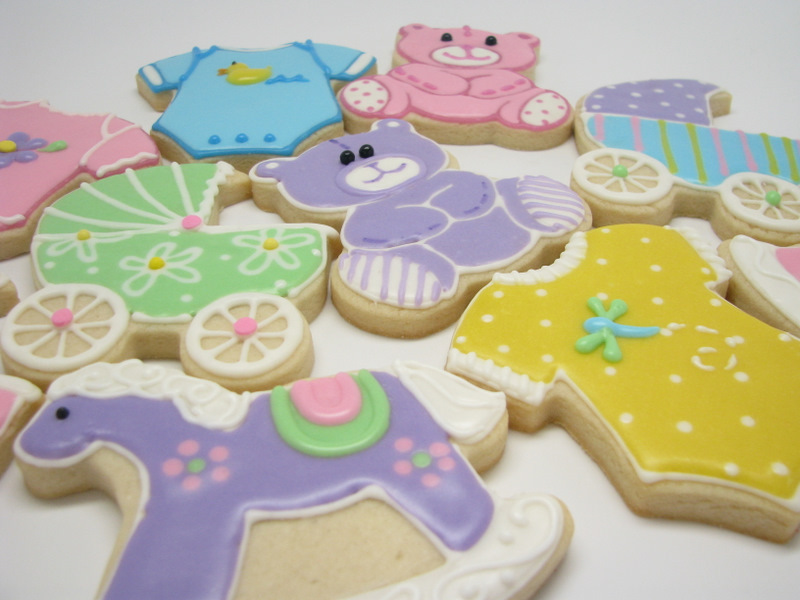 Comment on this post by Midnight on Wednesday, March 9th, and you’ll be entered to win a Onesie Cookie Decorating Kit all your own. This time, I’ll let my daughter pick the winning number because the 9th is her birthday, and she asks me every time I do a giveaway if she can PLEEEEEEEEEEEASE pick the number. Since it’s her birthday, I’ll let her pick this time. I think it’s probably as good as Random.org! Are more babies born in the spring? That is the question of the day. Two of my four were born in the spring. The other two were born in the winter. 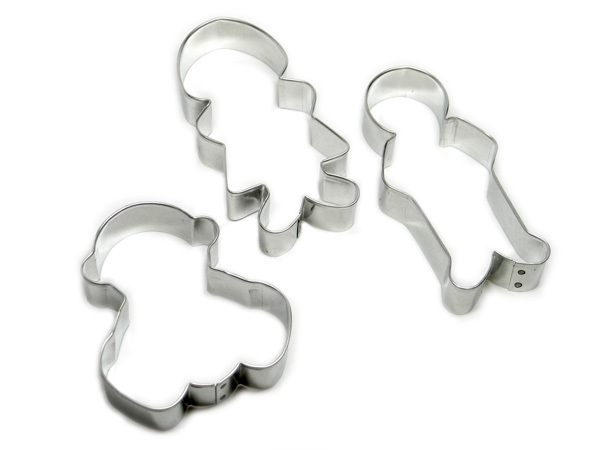 So from my experience, it’s half and half, but we sure sell more baby cookie cutters in the spring than we do in the winter. Maybe it’s just because we get more excited about throwing showers and parties in the spring and summer than we do in the winter with all the other holidays. Maybe we just get in party overload mode in the winter. They were fun! I’ll start with my least favorite first. The rocking horses. Sometimes I can do them, and sometimes I can’t. This decorating session turned out to be a “not-as-cute” day. I don’t know. Do you put faces on rocking horses? And if so, how? Maybe I’m just not a horse person. 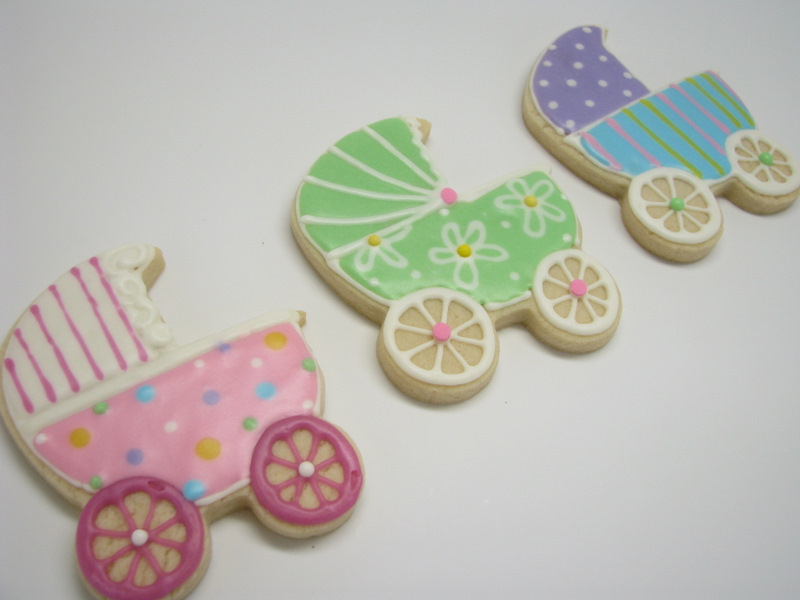 Next are the baby buggies. So the question here: How far apart do you put the eyes? I wasn’t sure, so I did 3 different distances. (By the way, I used black sugar pearls for the eyes on these. I really like using those for eyes.) I think I liked the blue one the best. Not too close, not too far apart. Awww. 🙂 Baby stuff is just so cute and fun. 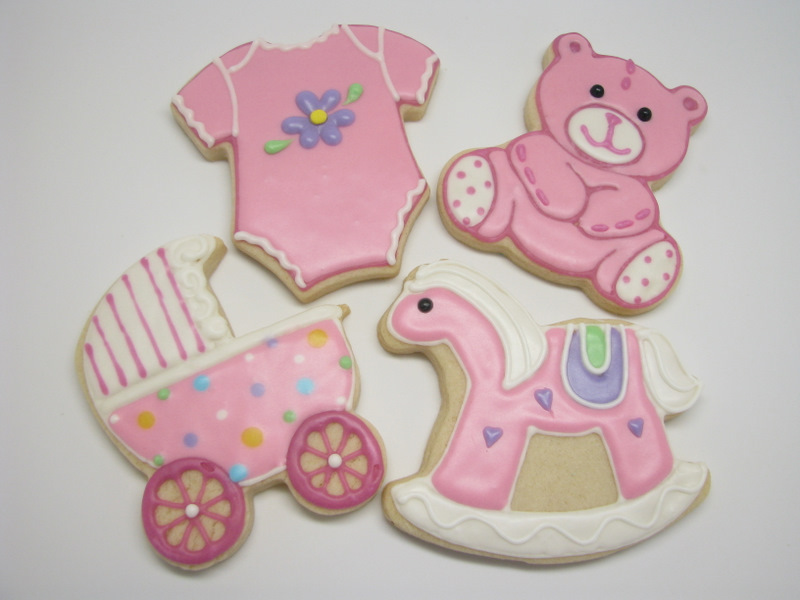 We have a onesie cookie decorating card if you’re interested in more info on how to do some cute piped embellishments for onesies. 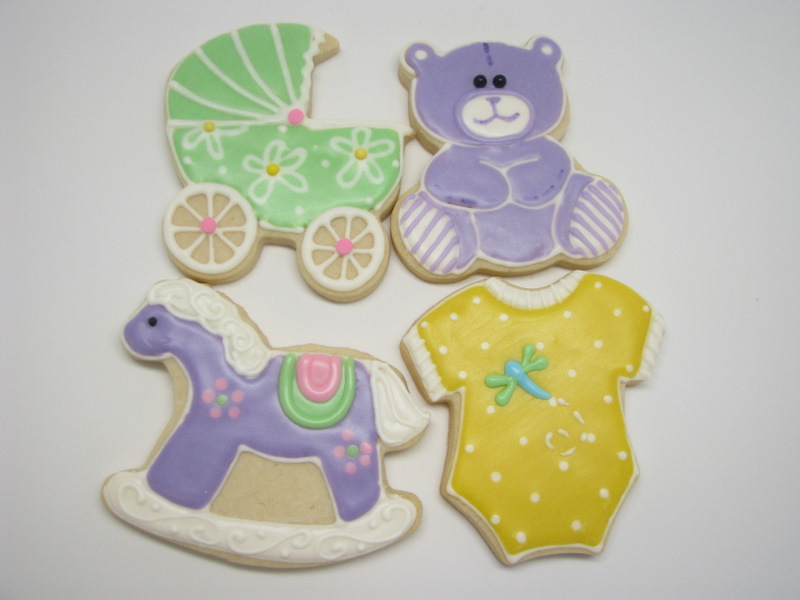 Do you want to make some baby cookies? 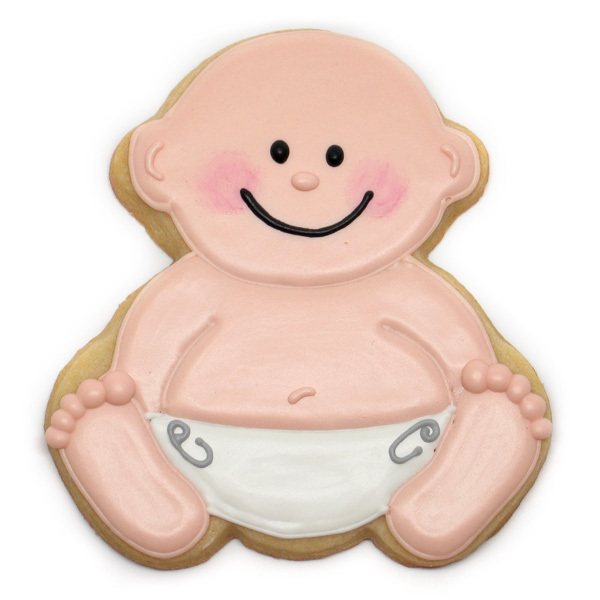 Comment on this post by Friday, Feb. 25 at midnight (Mountain Time), and you’ll be entered to win your own set of Wilton Baby Cookie Cutters plus our Onesie Cookie Decorating Instruction Card and our Baby Buggy Cookie Decorating Instruction Card. I’ll use random.org to choose one winner. Thanks for reading! 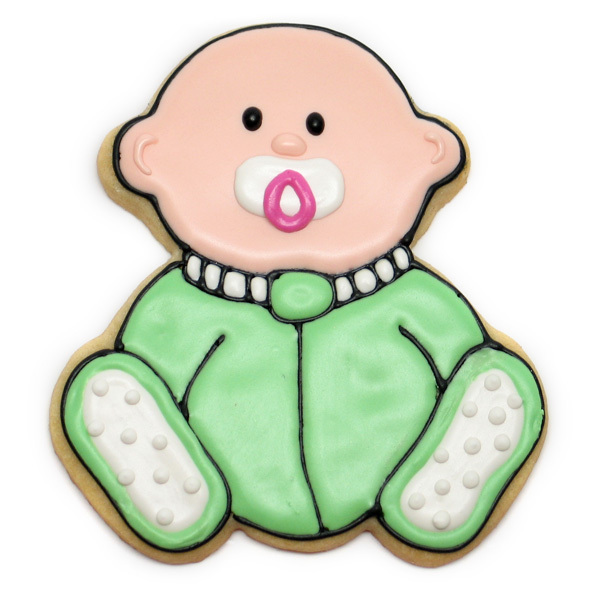 Now I’d better get in the kitchen and work on some St. Patrick’s Day cookies! That’s sneaking up on me!